Turn your phone or tablet into a musical instrument! RD4 - Groovebox is a music making app with virtual analog synthesizers, drum machines and effects. Compose and arrange your music in real-time. Choose instruments individually for the 4 channels and set notes with the dedicated sequencer or piano roll of each instrument. Choose instruments individually for the 4 channels and control your sounds on the mixer page. Adjust the volume of each track or fade in or out your beats, melodies and musical phrases. Mute or solo the sounds and choose one of the 4 effect channels for each track. Create fat sounding bass and powerful lead sounds. Analog is modeled after legendary monophonic synths of the ’70s. It has 3 oscillators with 6 different waveforms and each oscillator can be tuned precisely. Use the warmth control to get the typical analog tone. Shape your sound with the low-pass filter and the envelope generator with Attack, Decay, Sustain and Release. Set notes using the piano roll or record notes in real-time. Read our FAQ for low latency on Android devices. Use the piano roll for editing recorded notes comfortably or compose by drawing notes directly with the piano roll in 1/16 or 1/32 resolution. Produce bubbling basslines and screaming lead sounds. Bassline is a real-time virtual analog synthesizer modeled after the legendary 303 that had a major impact on the development of contemporary electronic music. This synthesizer comes with a high-quality low-pass filter with resonance, cut-off, and envelope controls. The oscillator offers 4 different types of waveforms. Use the multitouch control to alter parameters simultaneously and compose musical lines with the built-in 16-step sequencer that includes also accent and slide settings per note. Make beats with booming kick drums, snappy snares and throbbing percussions. Choose between 10 different drum kits based on legendary drum machines: 808, 909, 606, CR-78, Linn, KR55, RX11, RZ1, DMX and DPM48. Every drum kit has 8 different drum channels each with a mute button and its own punch control that adjusts the volume and modulates the sound envelope. Apply effects to each drum machine channel individually. To set your steps use the pattern based step sequencer with accent programmable for each drum channel. Alter your synths and drum sounds with the 5 real-time controllable audio effects reverb, delay, phaser, filter and distortion. All effects are freely assignable to each synth or drum channel and can be controlled each with a X-Y control field for the main parameters. RD4 - Groovebox supports MIDI on iOS and Android. RD4 connects to MIDI keyboards and controllers and supports also external MIDI clock sync. On iOS we are using Core MIDI and for Android we developed our own MIDI framework. 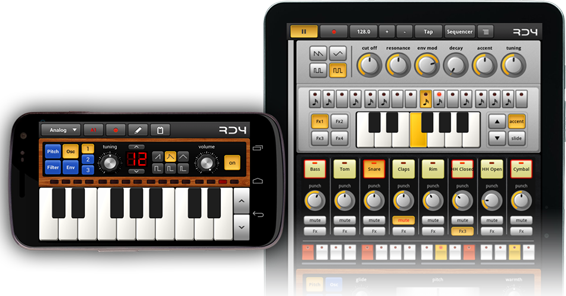 Read more about MIDI on Android here and iOS here. Loops you’ve created and exported with RD4 - Groovebox can also be easily integrated into our audio mixer app SPC - Music Sketchpad.